Reverend Horton Heat performing at the House Of Blues, Mandalay Bay Las Vegas on February 2nd 2011. The Dreamscapes Project performing at the State Theatre on Saturday February 19th 2011. MyJoogTV: The Dreamscapes Project - "February"
The Dreamscapes Project performing "February" at the State Theatre on Saturday February 19th 2011. Donna the Buffalo performing at The State Theatre in Falls Church Virginia on January 14th. Donna the Buffalo performing "Conscious Evolution" at The State Theatre in Falls Church Virginia on January 14th. This episode of MyJoogTV features Sarah Siskind and Travis Book, bassist for The Infamous Stringdusters, in a discussion of beer, music, and The Festy with Devils Backbone Brewing Company master brewer Jason Oliver. The episode was filmed during The Festy, The Infamous Stringdusters' signature weekend music festival held on the festival grounds at Devils Backbone. Specifically we discussed Siskind's affection for beer as well as her beer blog; The Festy; and the award winning beers crafted by Oliver. The episode concludes with Sarah Siskind and Travis Book, accompanied by guitarist Andy Falco, performing "Wild Fire" on the Southern Stage; and The Infamous Stringdusters on the Main Stage at The Festy. The video is available to download for iTunes and Windows Media Player. To view more videos filmed at The Festy, visit the MyJoogTV Festy Channel. And a special thanks to Nelson County Tourism for sponsoring our trip to the region. 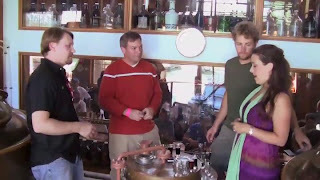 MyJoogTV Episode 8: Sarah Siskind & Travis Book @ Devils Backbone Brewery from MyJoogTV on Vimeo.